Hotel Ochsen Binzen, Hotel Germany. Limited Time Offer! Hotel Ochsen. 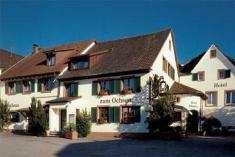 The 3-star "Hotel Ochsen" is an excellent base from which visitors can explore Binzen. The rooms are warm. Observe nature in the private garden. The hotel is situated in the Markgräfler region of Germany, in the southwest corner where France, Germany and Switzerland meet. It is only a 15 minute drive to both France and to Switzerland.